There’s a huge and ever expanding range of Android™ mobile phone apps for photographers these days, from photography album organisers to basic editing and special effects. When it comes to what’s useful out in the field though, sometimes it’s the simpler apps or even those which aren’t aimed specifically at photographers that I turn to most often. This app shows sunrise and sunset times and directions, twilight times, and moon rise and set times. I particularly like the lunar path feature, which is invaluable for planning night time landscape photography by showing just where the moon will be in the sky. 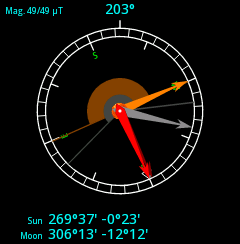 The compass option (shown right) is handy too for orienting yourself with the current position of the sun and moon (obviously assuming they’re not already visible). It also indicates the range of angles at which the sun and moon be above the horizon. The pro version of this app includes a solar path function too. There are several all singing, all dancing apps around which cover a range of photographic calculations such as depth of field, angle of view and exposure calculations. I find that in practice though, depth of field is the calculation I need most often. I like DoF Calc for it’s simplicity and speed of use, with the interface consisting of four simple wheels which are simply pushed up or down to pick your desired settings. That simple interface really does make a difference when you’re outdoors with frozen fingers. I mostly use this app simply for calculating hyperfocal distance and working out what apertures I can use based on the nearest object in the shot. Knowing the time and level of low and high tide is vital for photographing coastal landscapes, not only to help plan the shot but also for safety reasons. 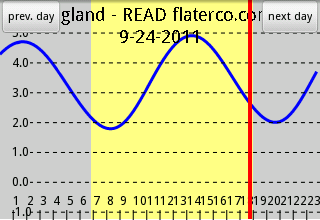 This app has a simple graph of water levels with a clear indication of current time (shown as the red line in the screenshot to the right). I like the way that daylight is highlighted in yellow too, which helps when you’re looking ahead for days when sunset or sunrise coincides with a particular water level. The app allows you to search for tide stations by name or simply find the ones nearest to your current position. Google Sky Map uses your current location and the phone’s tilt sensors to show a star map which aligns with the direction in which the phone is pointing. You simply hold it up to the sky to show the stars, planets and constellations as if the sky was being viewed through the inbuilt phone camera. 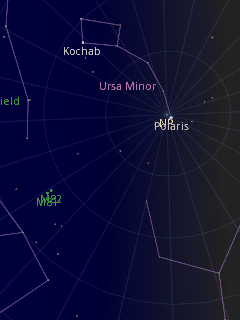 I use this app for the simple but useful purpose of identifying the position of the north star, Polaris. This in turn helps me work out compositions for star trails shots, even in daylight, by picturing the stars rotating around that point. This is an enormous shortcut and takes a lot of the guesswork out of night time compositions. 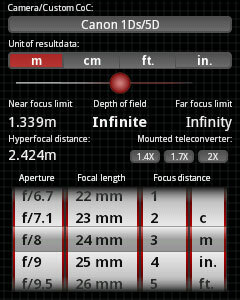 PHOforPHO (Phone Tools for Photographers) offers a whole range of photography based calculations. Part of it’s functionality offers depth of field and hyperfocal distance calculations and overlaps with DoF Calc mentioned above, although I prefer DoF Calc’s interface for those features. 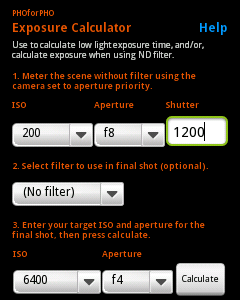 The function I do find myself using from PHOforPHO from time to time though is the Exposure Calculator, which is useful for working out equivalent exposures when shooting in low light conditions or with strong neutral density filters. There are other apps which offer these features and more (e.g. Photo Tools and CamCalc) but I find PHOforPHO’s options suit me here, including support for up to 13 stops of ND filter, 1/3 stop progression for aperture and ISO, and full flexibility on shutter speed. There’s an option to pass the calculated exposure straight to a handy timer too, which counts down to an audible alert during the last twenty seconds.